The proposed high-speed railway line between Lyon and Turin continues to be one of the most divisive topics in Italian political debate. The vast majority of works along the line stretching over 270 kilometres - 70% in France and 30% in Italy - is still far from commencing and the project is still largely on paper. Only complementary works, totalling 21km of survey galleries, have been excavated so far. The most controversial part of the project is a a 57.5 km-long base tunnel cutting through the Alps, under the Mont Cenis: if completed, it would be one of the longest railway tunnels in the world. Ever since talks began 30 years ago, residents of most of the 112 towns affected by the project are strongly opposed. Both sides of the Alps have witnessed protests, marches, active militancy and appeals to the highest courts. While in Italy the opposition to the TAV project ("Treno Alta Velocita") spilled over heated debates, sabotages, court cases and prison sentences against the so-called "No TAV movement", the French opposition has generally gone unnoticed in the eyes of the public opinion. As the Italian government is "totally re-discussing" the project,Euronews has travelled along the imaginary line of the Lyon-Turin high-speed railway, to find out what the residents of the regions flanking the site think and what problems affect or will affect their daily lives. The project has changed a lot from the first draft in 1990/91. The new version will see the railway line cut the territory of the 1100-inhabitants town of Chimilin in half. It will be brought in by a tunnel and continue towards Chambery passing via a viaduct and another tunnel. 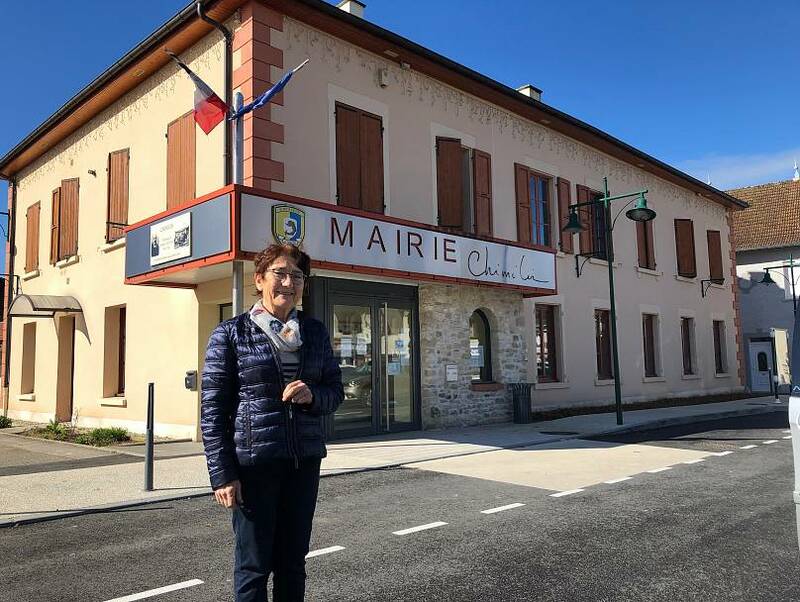 As local mayor Marie Chabert explains, the municipality faces the risk of having to cope with 1.5 million cubic meters of rubble being dumped on the territory, as a result of the excavation works of a 7km-long tunnel. The town hall, or 'mairie', has opposing the project since 1992. Most of the residents work in agriculture, commute daily to either Chambery or Grenoble or are employed in small industries nearby. One of them, the aluminium factory Martigny, cannot expand its operations as the neighbouring fields are earmarked by the high-speed train project. The mayor points at one brown field in the proximity. "That field over there belongs to the town hall, it is 2-hectares wide. We bought it for an expensive price as it was intended for industrial usage but now the space has been reserved [for the TAV project] and we will be reimbursed at the price of farmland. We will have clear economic damage". "We are facing an economic problem, here," Chabert concludes, "but also a difficult one to tackle as this is a project that is surrounded by uncertainty. There are no certain dates. Everyone is waiting for some answers, including the town hall". André Chaudron, farmer and president of the local association against the Lyon-Turin, lives next to the planned exit of the tunnel. He defines the project "enormous and useless". 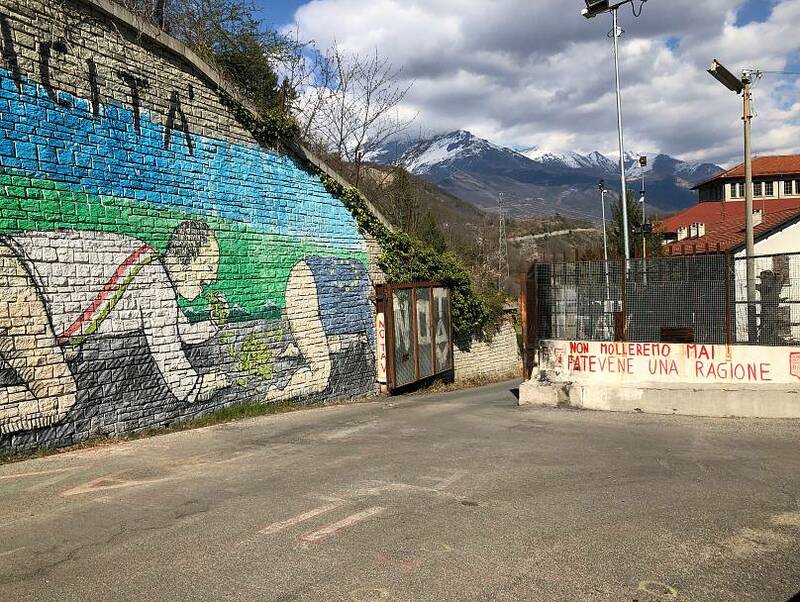 Second stop: Chapairellan, where residents fear the hole in the mountain that "threatens to collapse"
Chapairellan, the last town of the Isère department, is home to another citizen collective against the Lyon-Turin project. The railway line will arrive in the 3,000 strong village through another tunnel that will pop out where this "Non Lyon Turin" sign is. It will continue through the vineyards where a fruity white wine is produced. 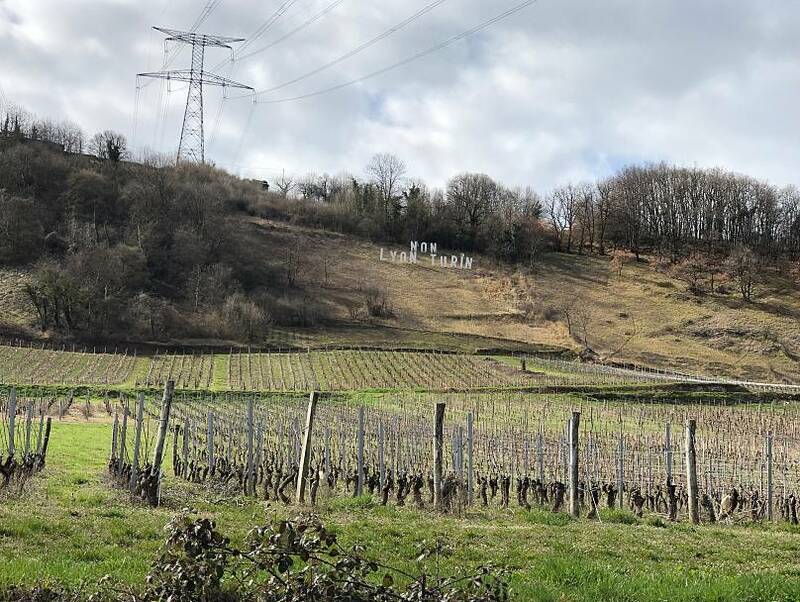 Stephane, a local baker, points out that "many residents of the region are against the project for a geological reason: it goes underneath the Granier mountain, an extremely fragile one. It avalanched twice already", once in the 13th century causing the death of around 1,000 people, and a second time in 2016. "We know that the mountain threatens to avalanche again, people fear that the tunnel drilling will pose a risk and we don't know what consequences it will have". Mont Granier has been compared to an active "volcano" for its "periods of instability". Besides the environmental reasons, the the opposition to the project in Chapairellan takes also an institutional route, as deputy major, Gilles Forte, explains. "Our opposition is made with appeals presented to the Council of State. The project changed a lot through the years, the planned itinerary has been modified many times and the costs are rising". Forte's words are affirmed by Daniel Ibanez, economist and French "enemy number 1" of the TAV project since 2012. "In France the opposition is different from that of Val di Susa, in Italy. That is a very concentrated valley with an important popular movement that reacts to the deafness of power. Here [in France] the first opponents are the French administrators, the Conseil Géneral des ponts et chaussées, the General inspection of Finances, the Minister of Finance." As a study points out, "usefulness, more than responsibility, has been the banner of French opposition since 2012. The theme of responsibility in Italy echoes the claim for local territorial legitimacy". "With the existing line", Ibanez adds, "we are already able to transport goods and go from Paris to Milan in 5h30min, so we don't need to spend around 30 billion euros to do it in 4 hours". 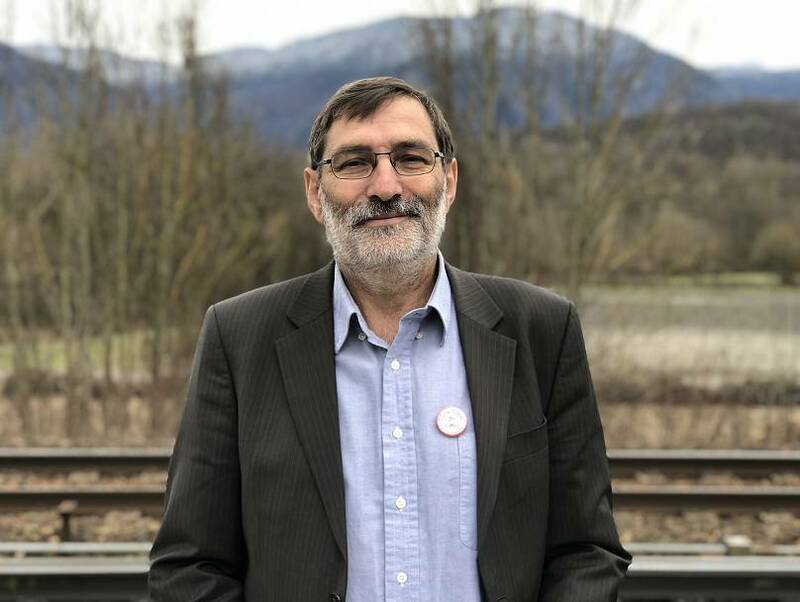 Jean-François Roussel, former head of the Modane train station, is standing next to the so-called "old railway" line in the proximity of Montmélian. It stretches towards Italy and reaches the other side of the Alps through the Frejus tunnel. Both the "old line" and the Frejus tunnel have been renovated after 2002 to meet modern safety criteria and to allow the circulation of bigger quantities of containers. 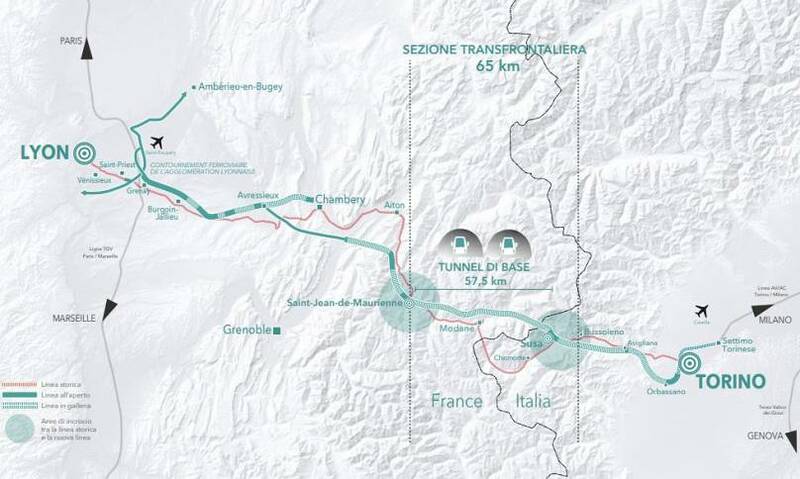 The problem, as critics of the Lyon-Turin project point out, is that the international trade between Italy and France is in decline: in 2000, 9 million tonnes of goods per day used to cross via the Frejus tunnel, while nowadays this number goes down to 3 million daily tonnes. The hypothesis of the "line saturation", put forward decades ago, has been defined as "anachronistic and unreasonable" by Italian authorities. Those in favour of the project argue instead that the traffic can be increased as the TAV would overcome the limits of the "old line" - such as the towing capacity, high gradients, the winding route and the maximum length of the train. "This existing line already meets the best SNCF standards. In the 1980s, more than 60 freight trains per day used to run here, today we only have about 10. From here it passes only one freight train per hour, this is a real disaster for the usage of this line as its capacity can sustain without any difficulties more than 10 trains every hour". Villarodin-Bourget, a 500-people border-line village clinging onto the Alps, in Savoie, is the stronghold of French opposition to the TAV. Since 2002, residents have protested the digging of the 4km-long survery gallery for the base tunnel. From the town, one can clearly see the artificial hill created along the river L'Arc with millions of tonnes of excavated materials. Some houses fly the "No TAV" flag and its representatives are in close relationship with the Italian "No TAV" movement. In the past years, many have been the exchanges between the two sides of the Alps including joint organisation of demonstrations and environmental marches. The "Association pour la Sauvegarde du Site du Moulin", comprising land owners who have been expropriated of their lands, says that the debris has a strong impact on the local landscape and land-owners have been "undercompensated" by TELT, the company in charge of the excavation of the tunnel. Gilles Margueron, major of Villarodin-Bourget, points out that TELT "have a say on every dossier we present to the Region, given the impact of the construction site on the village", and that some other majors in the valley tend to be in favour of the project because of the economic incentives and the creation of the jobs in the territory, "even if they are created for no longer than a dozen years". "After we started looking at the project in details, we soon arrived at a position of complete opposition", continues Margueron. "We thought that it had been well-thought out by some super-intelligent people who knew their stuff, but we soon realised that what it has been forecast for 2020 was the opposite of what it became reality. Despite this, we have been told: "We made a mistake in the numbers in 2006, however we already started the works and now we have to continue them". In February 2018, the Conseil d'Orientation des Infrastructures, wrote that the railway lines included in the French project are not to be considered a "urgent" matter and its construction could be postponed to "after 2038". "In France we are capable of doing a tunnel without building access routes to it", Margueron adds. After a "pause" to consider strategic investments, including the TAV, the Macron government has however reiterated its commitment to implement the bilateral treaties and has asked Italy to finally make up its mind. Locals also fear for their jobs: "The construction of the tunnel will affect tourism, if people will not be coming here, this will create a big economic damage for us", says Sylvan, an alpine mountain guide. Philippe Delhomme, vice major and president of the "Vivre et Agir en Maurienne" group, said to Euronews that the project is not "environmentally sustainable", adding that an increasing number of town halls - including Grenoble and Aix-les-Bains - oppose it. "There is a strong link that connects us to the Susa Valley. We want to show that, before doing a project, residents involved should be asked their opinion. Do States really need it? Do locals need it? In fact, they do the opposite. They come up with a project and eventually ask the inhabitants: what colour do you want the train to be?. This is not democracy"
They come up with a project and eventually ask the inhabitants: what colour do you want the train to be? The final stop of our short road trip is Susa, the most prominent town of the Susa Valley, on the other side of the Frejus tunnel. The majority of road traffic passes through this 14km-long tunnel, connecting Modane and Bardonecchia. Out of 44 million tonnes of goods exchanged between France and Italy in 2017, only 3.4 tonnes (7.7% of the total) have been transported on freight trains. The Modane-Turin line has lost almost 70% of its traffic in the last 15 years. Critics of the project argue that the demand of goods between two "mature" economies is simply not enough, and therefore these declining numbers don't justify the drilling of another hole in the mountain. Those in favour argue that benefits of a faster train line will boost both commercial exchange and passenger numbers. In Susa Valley, the opposition to the project has historically had the name: "No TAV movement". 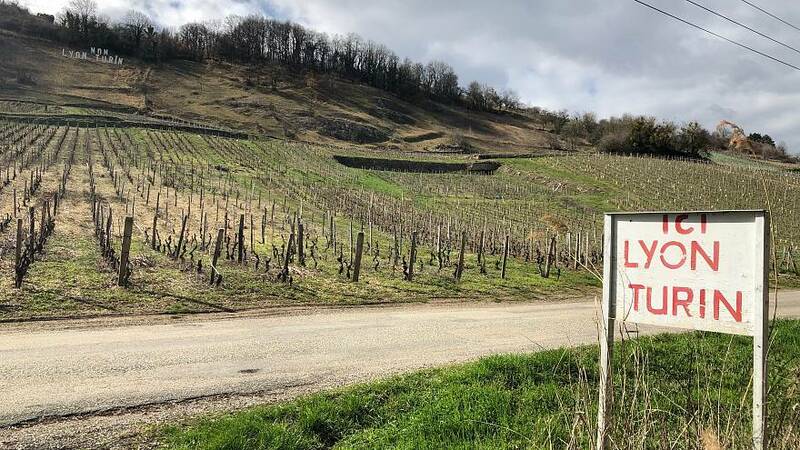 In the past, notably in 2005 and 2011, it clashed with the police when its activists tried to stop the construction works of the survey tunnel in Venaus and Chiomonte, west of Susa. Taken aback by the intensity of the protests, successive governments in Rome have havered and dallied. In all these years, magistrates in Turin have followed suit with arrests and court cases brought against No TAV activists. Italian media and political parties often depict the activists as a group of extremists infiltrated by violent anarchists and troublemakers. However, its opposition methods are inspired by non-violence. Most of the majors in the valley, and large part of the local population, support the cause. We spoke to three of their representatives in Susa. Diego Fulcheri, a pensioner who moved here in the early '90s, explains that the No Tav movement pulls together people from different backgrounds. "There are anarchists, Catholics for the Defence of the Land, pensioners, left-wing activists...all of them have two fundamental characteristics: they are anti-fascist and anti-racist". Some of them are involved with the NGOs saving migrants trying to reach France in the perilous journey across the Alpine border. 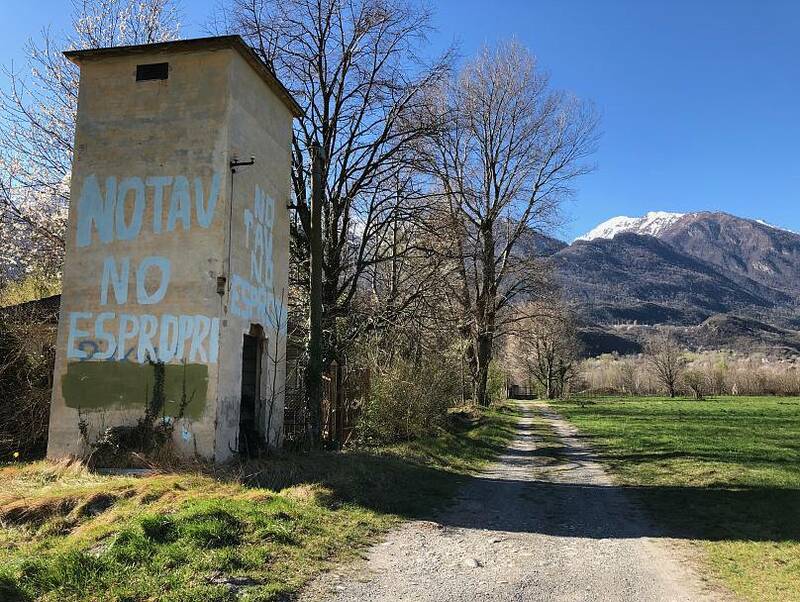 Over the last three decades, the No TAV movement has constantly "making the authorities feel the pressure" of the valley with non-violent initiatives around the Chiomonte construction site. Some of them include communal dinners, debates, aperitifs and flash mobs. "Almost every day, a group of Catholic No TAV go there and pray for their wasted land and, at the same time, monitors what is going on within the construction site". Fulvio, another No TAV activist, has chosen to live in a portion of land occupied by the movement in Venaus, at a time in which the drillings where scheduled there. He is a permanent resident of a hut called "Presidio". "From a 'nimby' movement against the train, we became a united community looking for an alternative model of development, careful of the needs of the people living here ", he tells Euronews. Another activist, Guido Fissore, highlights that there are many young people in the valley ready to take the relay from the old peers. "We, who started the movement, are old now but there are many youngsters who are growing up, so they will find opposition if and when they will try to open the construction site here in Susa". The economy of the Susa valley, where everyone seems to have a deep knowledge of the TAV dossier, is not flourishing. Many factories have shut down since the '80s, especially in the iron and steel sector, and workers tend to commute to Turin to find employment. The wife of one No TAV activist will have to deliver in the city as the local maternity ward has been closed. Local journalist Giorgio Brezzo, of the weekly newspaper La Valsusa, points out that promoters of the project "have talked about the creation of some 50,000 jobs, and this has raised hopes in those who struggle to find a job, are unemployed or whose children are jobless. It has divided the opinions of the population. Some families are now split apart by the issue". At the end of May, most of the municipalities of the Susa valley will elect new representatives on the same day of the European elections. Brezzo argues that the TAV issue will still be an important one, but not as decisive as in the past. "It seems that the only problem in Italy is the TAV. To do it or not to do it, we are already fed up. We can't take it anymore".